The Hiltonairs first album. 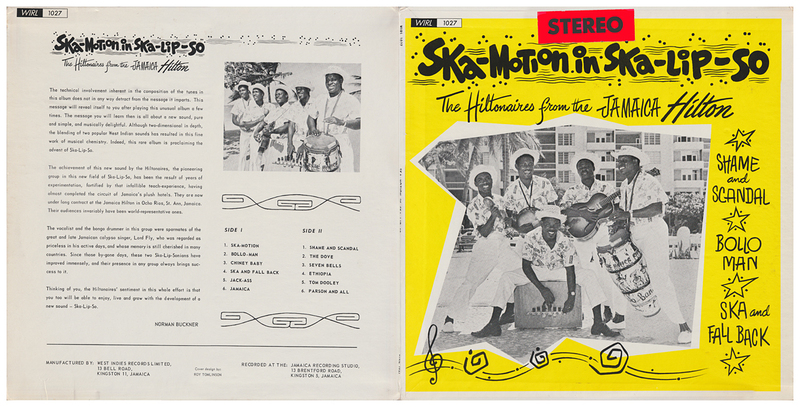 It was recorded at Studio One but pressed at West Indies Records Limited (WIRL). The sticker (not present on all copies) says STEREO, but it sounds like mono to my ears. The cover design is by Roy Tomlinson. For more information about Hiltonaires' albums visit Michael Garnice's excellent Mento Music site. To see more Hiltonairs albums recorded at Studio One click here. Jamaican reissue with hand written matrix. Some sleeves carry a green MONO sticker. Reissued in 2003 on a Port-O-Jam label with sides reversed.